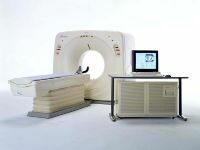 Description: (1) YEAR 1999 TOSHIBA MODEL ASTEION  Spiral / Helical Sub-Second 0.75 Scan Time. Asteion VI upgraded to Asteion VR, with 48 kW generator, in January 2003. It has DICOM. Single Slice CT Scanner. New in 1999. Available immediately. Sub-Second Reconstruction. Aspire CI with Fluoro, High Speed Processing and Multi-Tasking Computer, Surestart for Live Contrast, Real-Time Helical, Latest Revision Software 1.7, 4.0 mHu Helicool Tube with only 140,000+/- Slices. Tube new in July 2002. Helical Scan Time of 0.75 Seconds and 100 Seconds of Continuous Maximum Helical Scan Time. Solid-State Detectors, Slice Thickness 1mm through 10mm. Sold As Is Ex-Our Warehouse, Shipping Installation Training NOT Included At This Price.